The House Carpenter is a set of variations on an Appalachian ballad of the same name. This ballad is part of a large collection called the Child Ballads, recorded and catalogued by Francis James Child. Most ballads in the collection have one or more variants, both in melodic material and narrative, due to the manner in which they were passed on from person to person. The House Carpenter attempts to fit into this tradition through its theme and variation form. Each time the melody reappears it is slightly different, either rhythmically, melodically, or with a different tonal center, which fits nicely into the ideal variation form, but is also meant to imitate how these ballads gradually changed through time and place. The piece also fits into the ballad tradition through its fluidity in key; the Ballads were often sung unaccompanied and singers would change key multiple times mid-performance, sometimes spanning several key centers within a verse. The House Carpenter tries to capture this inconsistency through the melody’s traversing of several key areas within each iteration, beginning in one key area and gradually sliding down to others. Finally, the piece explores the concept of the theme and variation form. 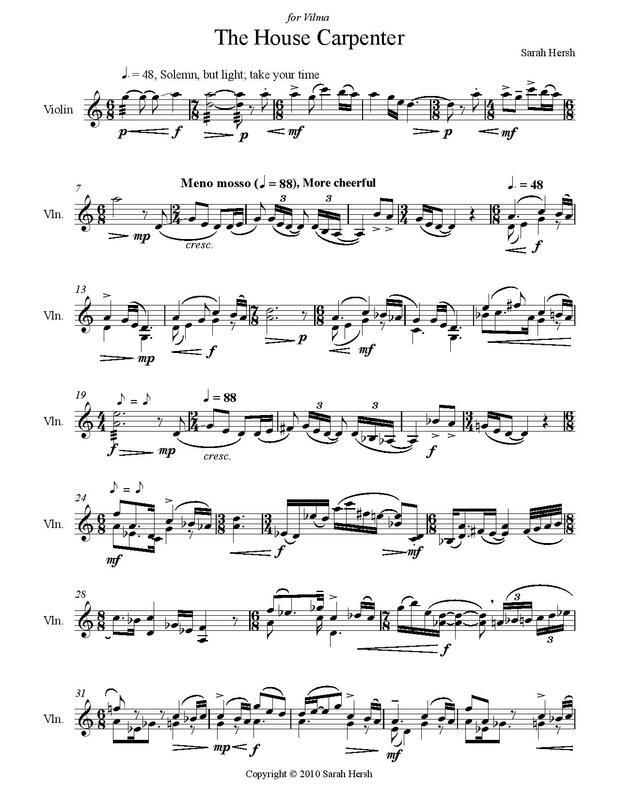 While the theme should be apparent to some extent throughout the piece, each variation takes more and more liberties with the boundaries of the thematic material through an expansion of pitch language and flexibility with rhythm and meter, distancing itself farther and farther away from the source material. Every now and then a glimpse of the original theme shines through the increasingly complex variations.